In the early stages of my travels in Cambodia, I was wracking my brain to think of any fish-related activities I could pursue in a country which, although rich in aquatic life does not have an ornamental trade and only a very small hobby community. It was a unique bit of luck that led me to an old Phnom Penh Post article about an aquarist living in Cambodia who had started an initiative to save the country’s native tigerfishes (Datnioides spp. )—commonly called “Dats” in English. Intrigued, I did some digging and with the help of Google translate was able to get in touch with this aquarist, Tomoyuki Sato, and we arranged to meet. I met Mr. Sato in front of one of the many night markets in Siem Reap—Cambodia’s bustling tourism capitol and home of the famed Angkor temples—for an interview over a round of beers. He is energetic, abundantly enthusiastic, and a prime example of how a dedicated aquarist can make a real contribution to the conservation and study of the aquatic life they love. A Japanese expatriate, Mr. Sato moved to Cambodia five years prior to focus entirely on his fish related research. The journey that led him here began many years earlier, when he worked as an aquarist at a public aquarium in Shiga prefecture, Japan. It was his work at that aquarium—which contained a number of exhibits showcasing the fish of the Cambodian Mekong and Tonlé Sap Lake—that would spark a lifelong passion. As a private hobbyist, he was well acquainted with many of the popular aquarium fish which hail from this region, and became engrossed in researching their habitats and habits in the wild. 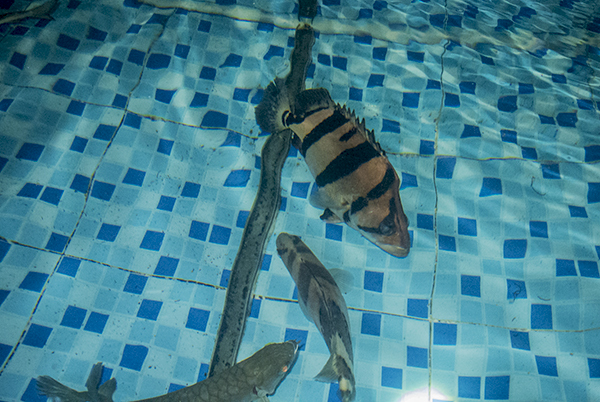 Mr. Sato made his first trip to Cambodia some 15 years ago, and encountering the fish he had cared for and studied in their native habitat was a turning point in his career. He soon realized the major gaps in research on the freshwater fishes of Cambodia—even today no comprehensive guide exists to identify these fish to the species or even genus level (a UN FAO publication, Fishes of the Cambodian Mekong, although extensive, includes only basic drawings and is rather dated). Finding basic information about range or preferred habitat for common species can prove difficult or impossible, further complicating his research. After compiling several years’ worth of information from his own collection trips, Mr. Sato decided to begin work on a massive undertaking—a complete photo guide to fishes of Cambodia. As we conversed about this book (over 10 years in the making to date), Sato showed me the results of this work on his laptop while animatedly discussing his methods. File after file of fish families—Eleotridae, Channidae, Belontidae, etc.—all contained high-quality photo documentation of each fish identified to the species level (not preserved museum specimens! ), along with photos of the habitat it was collected from and coordinates of the collection point. The level of detail was staggering—this was clearly work driven by a deep personal passion. One of the things to stem from this research was a realization that many of Cambodia’s native and endemic species are in grave danger. One, in particular, stood out among the rest during Tomoyuki’s many surveys of the Tonlé Sap Lake. 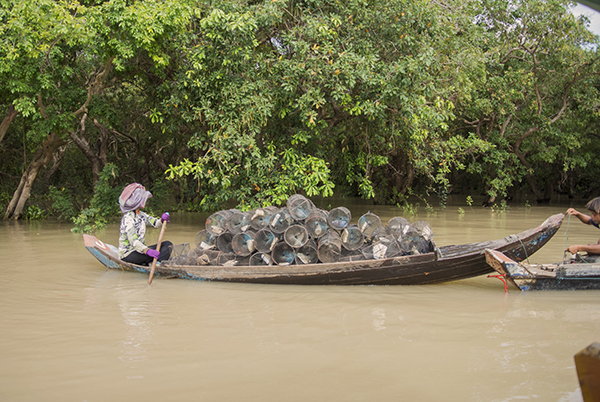 It was the iconic Cambodian Tigerfish, Siamese Tiger Perch, or Datnoid (Datnioides pulcher)—which despite numerous attempts to catch or locate in local markets—was nowhere to be found. In fact, Mr. Sato told me that the first live Datnioides he did encounter in Cambodia was a mature adult in an aquarium shop in Phnom Penh. I asked what was behind the decline in this magnificent predatory fish, long prized by aquarists (especially in Asia), and Mr. Sato seemed to consider this for a moment before offering a reply. The tiger fish of the Tonlé Sap had been hit hard by several factors, each of which was, unsurprisingly, human in origin. A prized food fish, mature or subadult fish have been heavily targeted in recent years as the human population around the lake grows at an unprecedented rate. At the same time, the seasonally flooded forests around the lakes edges (which act as nurseries for tiny and vulnerable Datnioides fry) have been heavily cleared for agriculture, eliminating much of this critical habitat. To compound this, juvenile fish have historically been harvested from the lake for the aquarium hobby, a fact that was a bit surprising to me as Cambodia is not considered an aquarium fish exporting country. Tomoyuki explained (corroborating what I have heard from others) that the Tonlé Sap’s native form of Datnioides pulcher—known by the trade moniker CT (Cambodian Tiger)—has in fact been a target for aquarium fish collectors, who then truck them over the borders to exporters in Thailand or Vietnam. This unregulated, quasi-legal trade is driven largely by demand for these highly prized aquarium fish in Asia, where specimens regularly sell for hundreds of dollars. On its own, aquarium collection for these fish may not have had significant impact on wild populations, but combined with the other major stressors this species faces it has no doubt contributed to their decline. With all these factors working against D. pulcher’s survival in the wild, I wondered how Mr. Sato intended to “save” it. When he replied he wanted to try breeding them in captivity (a feat which, as any serious “Dat” keeper knows well, has never been reliably accomplished), I was almost ready to discount the initiative altogether as being unrealistic. But as he discussed how he had proceeded with this task, long considered impossible, I was impressed with both his technical understanding of the fishes’ reproductive biology and the nuanced way in which he hoped to integrate captive propagation into an in situ conservation program. I was now very curious about his breeding project, and Mr. Sato kindly offered to show me his home lab and fishroom—so off we went, accompanied by his friend and our immensely helpful translator. At the moment, he was not actively working on breeding as the fish have a distinct breeding season (March- April) and will not engage in breeding activity outside that range. 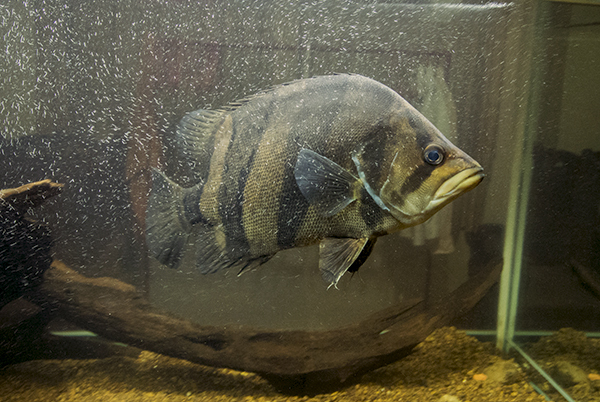 However, it was clear from the monster broodstock fish in his aquariums and outdoor “ponds” that he had well-conditioned, mature fish to work with. I will discuss in more detail the technical aspects surrounding Datnioides breeding (and past and current attempts at captive reproduction) in a later post, but I was sufficiently impressed with his setup and methods to say that Mr. Sato may very well be the one to finally “break” this genus. Given the impressive spate of marine breeding firsts we’ve seen from dedicated hobbyists in recent years, perhaps it should not come as too much of a surprise. Perhaps more impressive than the breeding project itself, however, was its ultimate goal. 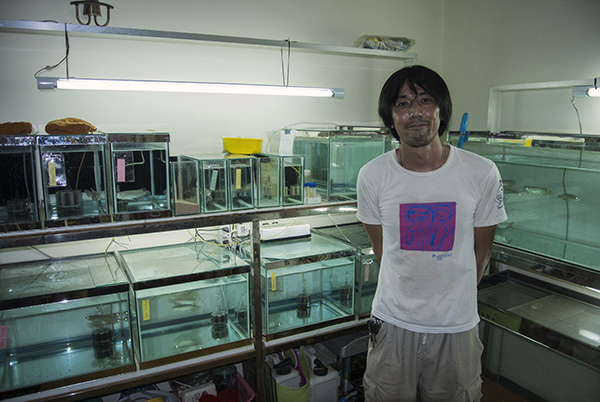 Mr. Sato realizes the commercial potential of this species in an aquaculture setting, but as a single aquarist and researcher lacks the facilities to attempt large-scale culture. Standard commercial culture would certainly help the conservation of the species by greatly reducing demand for wild fish. But Tomoyuki hopes to take it a step further and freely transfer his successful culture protocol (once developed) and integrate it into local communities around the lake, so that they can farm D. pulcher for both the aquarium trade and, ideally, a government-sponsored restocking program. A substantial amount of work and research still remains before these goals can be accomplished, but I applaud Mr. Sato’s foresight in advancing a conservation solution that includes local stakeholders and the global aquarium trade in a win-win scenario. 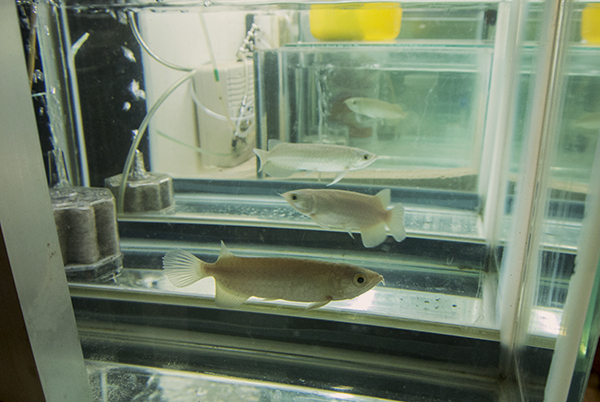 When we finally arrived in his impressively outfitted home laboratory, I was surprised to see not just tiger fish but juvenile Asian Arowana (Scleropages formosus). In yet another conservation initiative Tomoyuki has spearheaded, he had collected dozens of the critically endangered fish as small (and particularly vulnerable) fry from various river systems around Cambodia where these arowana can still be found in some numbers. After meticulously documenting the habitat and coordinates of each collection point, the fish were raised individually in his lab with each tank bearing the collection point and date in a neatly printed label. This post-larval rearing program is government-sponsored and is designed to help augment the dwindling wild populations of one of Southeast Asia’s most iconic fish by reintroducing mature, breeding-sized individuals into their habitat. By collecting small fish just beginning their free-swimming phase (after having been released by the mouthbrooding parent), Tomoyuki is removing them from the most dangerous part of their life cycle, when predators will pick off the overwhelming majority of juvenile fish. Once in the lab, he takes a fin sample of each fish for DNA fingerprinting which will be cross-referenced with the locality data—creating a database for each of the distinct and geographically isolated arowana populations found in Cambodia. Once the fish pass their delicate juvenile phase, they are taken to a government-run farm for further growth and conditioning before re-release. Once again, I found myself overwhelmed by this man’s quiet, careful dedication to aquatic research and conservation on display all around me. The fact that all this was the result of one aquarist’s singular devotion and passion was, quite frankly, inspiring. Whether or not he is able to breed and save the Datnioides he is so passionate about, Mr. Sato’s work stands out as an example of the ideal combination of aquarium keeping, aquatic research, and conservation.